channel called the Channel Trail. You can take either trail West for about a mile and then Levee Trail turns into single track as it heads North. It ends at a t-junction with the Moon Rock trail. Turn right and follow this single track East. It changes to Blevins and keeps going East. Near Cat Peaks the same trail changes names again to Meridian. Just keep heading East. After a short way you will pass a sign for the Spillway trail. This is a shortcut back to where you started but I'll describe the macho version of this ride. 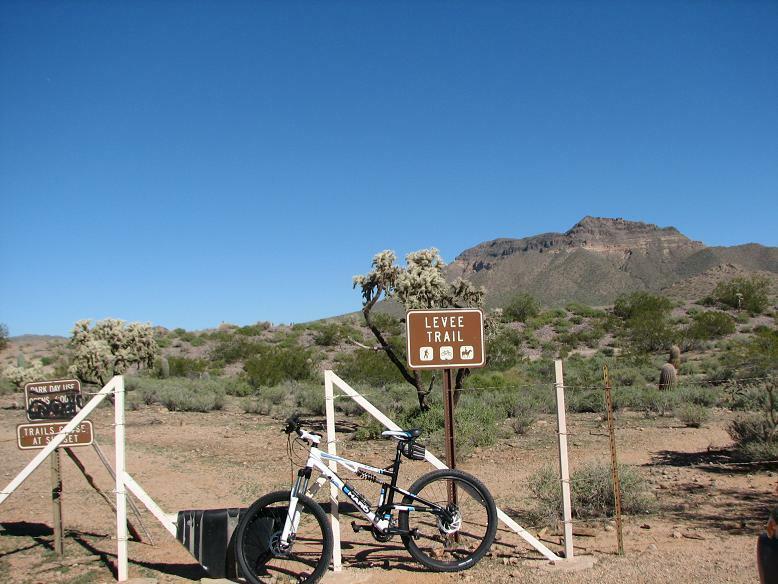 Continue East on Meridian until you come to County Line trail. Head South and enjoy some challenging dry wash crossings. If you can stay 100% on the pedals on County Line you should consider yourself at least an intermediate rider. At Ruidoso turn right. This trail will take you back towards Cat Peaks and the Spillway trail. Turn left on Spillway. It will lead you back to the Levee and Channel trails. Ride either trail West to get back to where you started. Levee Loop MTB Trail 0.00 out of 5 based on 0 ratings. 0 user reviews.